The Civilian Conservation Corps (CCC) was a public works program that operated from 1933 to 1942, as part of President Franklin D. Roosevelts New Deal. It targeted single men, 18-25 years, and veterans in relief of families who had difficulty finding jobs during the Great Depression. The program provided unskilled manual labor to environmental conservation and to development of natural resources in rural lands. The US Army supervised the camps, which had 200 men each. The earliest camps were set up in these Adirondack towns & counties: Arietta & Speculator (Hamilton); Bolton Landing (Warren); Tahawus, Newcomb, Schroon River, & Port Henry (Essex); Wanakena & Benson Mines (St. Lawrence); Paul Smiths, Goldsmiths, Tupper Lake, Lake Placid, and Fish Creek Pond (Franklin). There were eventually 26 camps in the Adirondacks. Enrollees signed up for 6 months and worked a 40-hour week for $30/mo. The government sent $25 to the enrollees, family and the enrollee received $5. The young men received good food, uniforms, and medical care. At first they lived in tents; later they lived in wooden buildings. These young men and special camps for war veterans were able to help their families and now had a sense of worth. In the Adirondacks enrollees built trails, roads, campsites & dams, stocked fish, built & maintained fire towers, observervation cabins & telephone lines, fought fires, and planted millions of trees. 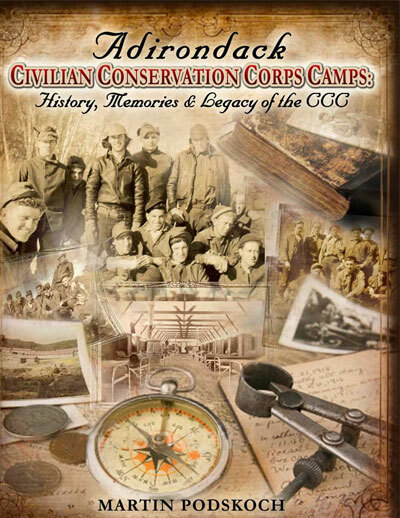 The CCC disbanded in 1942 due to the need for men in WW II. Nationwide, enrollees planted nearly 3 billion trees to help reforest America, constructed more than 800 parks nationwide, updated forest fire fighting methods, and built a network of service buildings and public roadways. In nine years, 2.5 million young men participated in restoring public appreciation of the outdoors. In 2006 Martin Podskoch turned from chronicling the history of fire towers in the Adirondacks to gathering information on the CCC camps in the Adirondacks. Over the next five years Martin traveled to towns in and around the Adirondacks and gave presentations on the CCC camps. CCC alumni, their families, and friends shared their stories and pictures. Clarence Petty, wilderness guide, pilot, district ranger, and conservationist, was one of the persons Martin Podskoch interviewed. Clarence first worked in 1933 as a forester at the Tupper Lake camp. He then advanced to camp superintendent at many other CCC camps till the CCC ended in 1942.